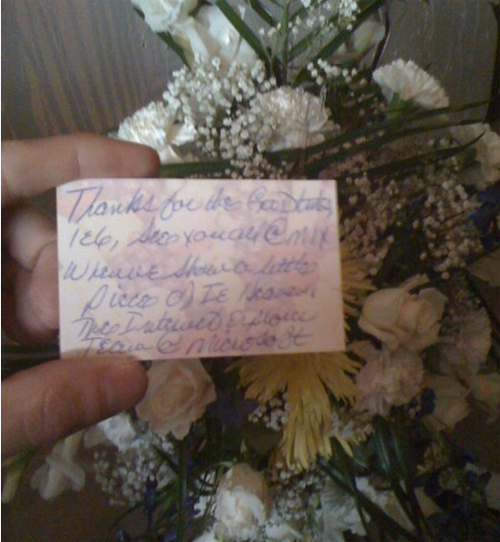 Microsoft sent flowers to last night's IE6 funeral, thanking the browser for "all the good times." The nine-year-old IE6 was laid to rest yesterday in Denver, Colorado, after suffering a "workplace injury" at the offices of a certain search giant in Mountain View, California. Mourners unable to attend were asked to send flowers, and Redmond's Internet Explorer team was among those who did so. “Thanks for the good times IE6, see you all @ MIX when we show a little piece of IE Heaven," read the card, a reference to this month's MIX tradeshow in Las Vegas, where the company is expected to announce the arrival of a new browser, Internet Explorer 9. “We want to give thanks to Internet Explorer 6 for its service for nearly a decade," one of Microsoft's IE6 mourners tells The Reg. "Internet Explorer 6 was built for a different world, a different time. While some customers may grieve the loss of Internet Explorer 6, we will continue to support it in its afterlife as we promised to do." As funeral organizers put it, Internet Explorer 6 is survived "by son Internet Explorer Seven, and grand-daughter Internet Explorer Eight," with IE9 on the way. "We understand the loss our customers feel when moving away from such a familiar aspect of their lives. With time’s passing, comes new life, and we encourage people to turn to Internet Explorer 8. Internet Explorer 8 is the modern browser for today’s online world – with rich built-in security and surfing tools that make it easy, fast and safe for customers everywhere." At tip of the hat to The Microsoft Blog.